A recently restored, spacious, high-capacity tavern-lounge car that is well suited for comfortable daytime travel. The lounge section offers seating for 25 guests to enjoy the passing scenery or engage in conversation with new friends. The tavern area seats 23 guests for light refreshments and snacks or a friendly card game. Can be used by itself or can accompany the Hickory Creek for larger parties. 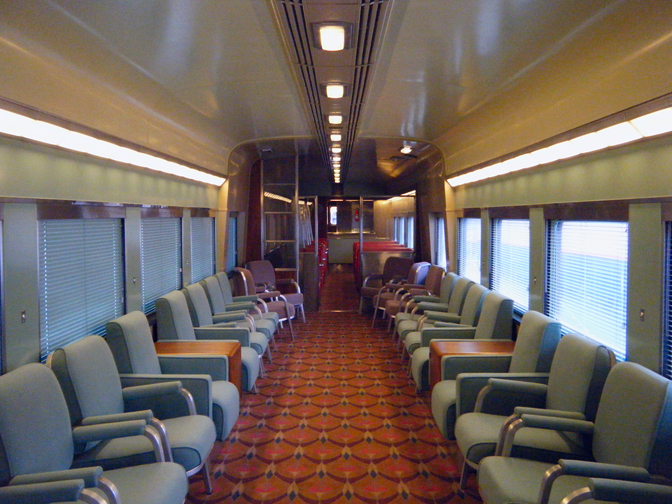 One of 13 Tavern Lounge cars (Nos. 35-47) utilized over the New York Central fleet of long distance trains. Later used on various Penn Central corridor trains between New York and Washington and then Conrail in commuter service, until finally retired by New Jersey Transit in 1987. Donated to the United Railroad Historical Society of N.J. in 1991 and eventually restored to the as-delivered configuration.